The Cellulac Group has developed a combined chemical and process engineering technology to produce Lactic Acid and associated industrial scale biochemicals from second generation feedstocks, including lignocellulosic materials (such as wheat straw, distilled dried grains with solubles and spent brewers’ grains) and lactose whey. Cellulac has recently announced an agreement to acquire the Great Northern Brewery, formerly the 2nd largest brewery in Dundalk, Ireland and retrofit to produce optically pure lactic acid for use as Poly Lactic Acid for biodegradable plastics. 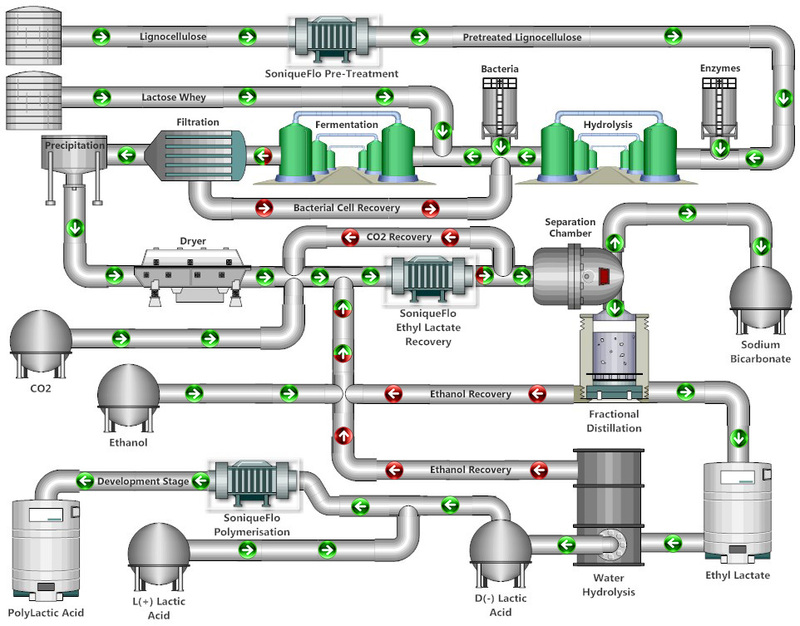 In addition to the production of lactic acid in Dundalk, Ireland, Cellulac expect to deploy this technology at other fermentation facilities either directly itself, through joint ventures dairy providers of delactose whey concentrate and in ethanol production plants where we already have our SoniqueFlo units installed in the US or through licensing arrangements with sodium lactate and biochemical production partners. Cellulac have acquired and internally developed an end to end chemical and process production solution that removes up to 7MW from the production of each ton of highly pure L(+) and D(-) Lactic Acid by removing 3 re-hydration and evaporation steps in the LA downstream process. In addition this process produces ethyl lactate as a single step process from sodium lactate to ethyl lactate (removing 7 steps of current Ethyl Lactate production). Normal Ethyl Lactate production requires Lactic Acid and then esterification with ethanol. Cellulacs’ single step process to ethyl lactate using a combination of CO2, ethanol and Sodium Lactate in a pressurised recycling vessel controlled by our SoniqueFlo (Shockwave) Cavitation device. This process creates a catalytic kinetic conversion by separating the Sodium and Lactic Acid in an inert CO2 and Ethanol solution causing the ethanol to bind with the separated lactic acid and the Sodium to be bound to the CO2 extruding Sodium Bicarbonate, ethanol, CO2 and Ethyl Lactate. By recycling in solution multiple cycles of the SoniqueFlo powered under pressurised CO2 a high volume is converted before being expelled into a centrifuge for separation (CO2 and Ethanol are recycled) Sodium Bicarbonate is removed and can be recycled as a pH balancing agent or sold as baking powder while the Ethyl Lactate is fractionally distilled from the ethanol based on the differing boiling points of the respective solution. Our >99% enantiopurity Lactic Acid is achieved by hydrolising the ethyl lactate with water to achieve the L(+) or D(-) isomer, depending on what bacteria we use for fermentation. Because of the elimination of the steps in the production process as much as 67% of the energy cost has been removed from the production of lactic acid. This process by and of itself has nothing to do with the raw material (substrate) and can be used in any existing Lactic Acid production facility, or indeed any existing brewery, bolted onto the side of an ethanol production plant using DWG and CO2 recovered from fermentation of ethanol. The technology behind Cellulac has been brought together from work that has been ongoing since 2003 through Dr. Patrick Walsh at pilot plant level since 2007. In 2009 the parent company was established as an R&D company and in 2013 Cellulac acquired the SoniqueFlo technology which had been developed over 12 years and used in the ethanol industry since 2008, scaling to pre-treat starch before liquefaction in 2011 and now processing 380 MMGY. As part of the significant investment that has gone into the development of the SoniqueFlo shockwave technology (acquired in July 2013 by Cellulac) in December 2007, the parent of Pursuit Marine Drive (Pursuit Dynamics “PDX”) completed a series of trials with the National Corn-to-Ethanol Research Centre,, in Edwardsville, Illinois to evaluate the performance of the ethanol shockwave reactor technology, a precursor to the SoniqueFlo shockwave reactors, in NCERC’s Generation 1 Corn to Ethanol pilot plant. These trials were run at an equivalent flow-rate of 5.1 million gallons per annum. The work programme completed with NCERC was the second phase of the Bio-ethanol process development programme that had been ongoing for 18 months. Following review of the NCERC results, the work moved to the final process optimisation phase and lead to the building of 8 SoniqueFlo units and the installation of 5 industrial scale units in 2011 that today are contributing to the production of 380 MGY of ethanol per year.